Are Zelda's dungeons a thing of the past? Well, according to the rumors, yes, they are. Legend of Zelda fan site Zelda Informer, has posted a bunch of rumors about the upcoming Zelda game for the Wii, that it says it is "99.99%" sure are genuine. The biggest rumor is that the game's dungeons will no longer necessarily be separate from the open world, with a much smoother gradation between the two. There will apparently be some dungeons that won't have bosses at the end of them, as well as boss monsters in the open world. 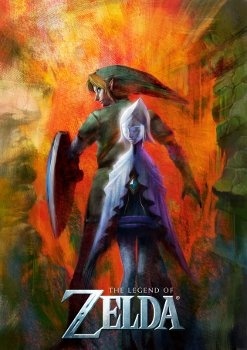 Other rumors say that the game will have no subtitle, and will just be called The Legend of Zelda. The game is also rumored to be set hundreds of years before Ocarina of Time and will show the creation of the Master Sword. The rumors apparently originate from a German translator working in Kyoto who was helping Eiji Aonuma with his E3 speech. The details are supposedly lifted from the first page, and made their way on to a German fan site, then to another German fan site and then, finally, to Zelda Informer. I have to be honest; my skepticism meter is in the red, and I'm taking this with a sizable pinch of salt. Nintendo's E3 press conference takes place tomorrow morning, so keep reading to find out if there's any truth to these rumors.